A research team led by UC Berkeley engineers has developed a new smartphone microscope that uses video to automatically detect and quantify infection by parasitic worms in a drop of blood. This next generation of UC Berkeley’s CellScope technology could help revive efforts to eradicate debilitating filarial diseases in Africa by providing critical information to health providers in the field. The UC Berkeley engineers teamed up with Dr. Thomas Nutman from the National Institute of Allergy and Infectious Diseases (NIAID), and collaborators from Cameroon and France to develop the device. They conducted a pilot study in Cameroon, where health officials have been battling the parasitic worm diseases onchocerciasis (river blindness) and lymphatic filariasis. The video CellScope, which uses motion instead of molecular markers or fluorescent stains to detect the movement of worms, was as accurate as conventional screening methods, the researchers found. The results of the pilot study are reported today (Wednesday, May 6) in the journal Science Translational Medicine. River blindness is transmitted through the bite of blackflies and is the second-leading cause of infectious blindness worldwide. Lymphatic filariasis, spread by mosquitoes, leads to elephantiasis, a condition marked by painful, disfiguring swelling. It is the second-leading cause of disability worldwide and, like river blindness, is highly endemic in certain regions in Africa. The antiparasitic drug ivermectin, or IVM, can be used to treat these diseases, but mass public health campaigns to administer the medication have been stalled because of potentially fatal side effects for patients co-infected with Loa loa, which causes loiasis, or African eye worm. When there are high circulating levels of microscopic Loa loaworms in a patient, treatment with IVM can potentially lead to severe or fatal brain or other neurologic damage. The standard method of screening for levels of Loa loa involves trained technicians manually counting the worms in a blood smear using conventional laboratory microscopes, making the process impractical for use in field settings and in mass campaigns to administer IVM. The serious side effects of Loa loa and the difficulty of rapidly quantifying Loa levels in patients before treatment make it too risky to broadly administer IVM, representing a major setback in the efforts to eradicate river blindness and elephantiasis. 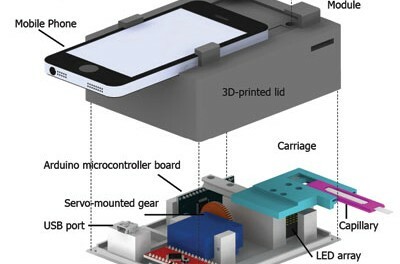 For this latest generation of the mobile phone microscope, named CellScope Loa, the researchers paired a smartphone with a 3D-printed plastic base where the sample of blood is positioned. The base included LED lights, microcontrollers, gears, circuitry and a USB port. Control of the device is automated through an app the researchers developed for this purpose. With a single touch of the screen by the healthcare worker, the phone communicates wirelessly via Bluetooth to controllers in the base to process and analyze the sample of blood. Gears move the sample in front of the camera, and an algorithm automatically analyzes the telltale “wriggling” motion of the worms in video captured by the phone. The worm count is then displayed on the screen. Fletcher said previous field tests revealed that automation helped reduce the rate of human error. The procedure takes about two minutes or less, starting from the time the sample is inserted to the display of the results. Pricking a finger and loading the blood onto the capillary adds another minute to the time. The short processing time allows health workers to quickly determine on site whether it is safe to administer IVM. Resh, who is not involved in the CellScope project, has worked in West Africa for 15 years on the control of onchocerciasis. The researchers are now expanding the study of CellScope Loa to about 40,000 people in Cameroon.